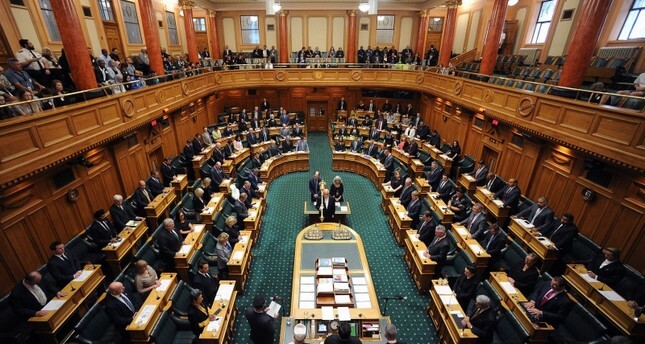 All but one member of New Zealand's parliament voted on Wednesday to change gun laws, less than a month after deadly terror attacks on two Christchurch mosques that killed 50 people. In the brutal massacre that took place on March 15, 50 Muslim worshipers were killed and as many injured by Brenton Tarrant, a 28-year-old Australian-born man. Tarrant killed worshipers in cold blood in the Al Noor and Linwood mosques in Christchurch, including four children under 18. The bill outlawing most automatic and semi-automatic weapons and banning components that modify existing weapons was passed by a vote of 119 to 1 in the House of Representatives on Wednesday after an accelerated process of debate and public submission. The sole holdout against the legislation was the ACT Party, which has a single seat in the 120 seat parliament. The bill needs only the approval of New Zealand's governor general, a formality, before becoming law on Friday. Prime Minister Jacinda Ardern spoke emotionally during the bill's final reading of the traumatic injuries suffered by victims of the March 15 shootings, whom she visited in Christchurch Hospital after the attacks. "There have been very few occasions when I have seen parliament come together in this way, and I can't imagine circumstances when it is more necessary," Ardern said in presenting the legislation. The new rules are aimed at removing semi-automatic firearms from circulation through a buy-back scheme, prohibition and harsh prison sentences. A hand-in amnesty will be in place until 30 September 2019, but perpetrators will face between two and ten years in jail for breaking the laws. The new laws also prohibit "semi-automatic firearms, magazines and parts that can be used to assemble prohibited firearms." The bill was first introduced on April 1. Its passage in barely 10 days has surprised even the most ardent gun control advocates.